Yep. 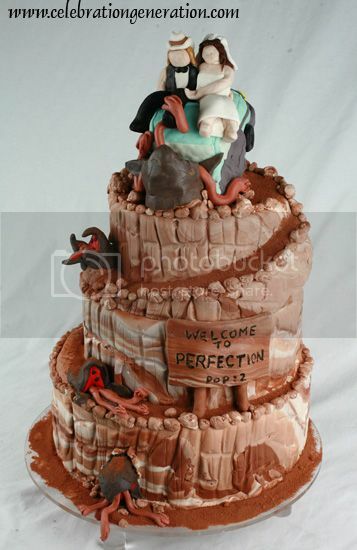 That would be a Tremors cake–and a wedding cake, no less–full of horrific Graboids and inspired by the 1990 movie. Credit goes to our ol’ internets-pal Marie of Celebration Generation, formerly of Unrivaled Super Mario Cake fame, but now officially of Immortalizing Kevin Bacon as a Tiny Chocolate Cowboy in a Tuxedo fame. 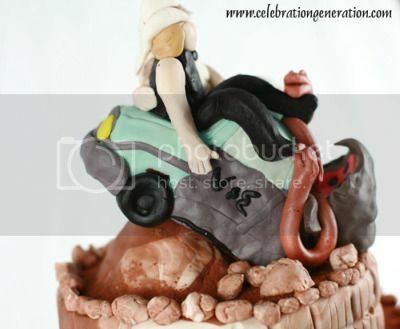 Whoever would have thunk that a cake featuring ravenous graboids and Val and Earl’s handyman truck would win a silver medal at Chocolate Show? Not me, man. But I try to limit my thunking-centric activities. …this is Milk Chocolate Cardamom Pear cake. Moist milk chocolate cake with a hint of cardamom to warm it up, then each of the 3 layers of filling is a Milk chocolate-cardamom ganache with sliced up poached pears. Yum! The name “cardamom” is used for herbs within two genera of the ginger family Zingiberaceae, namely Elettaria and Amomum. Graboids Cake made from candy plant, hell yeah!